I have a story to tell about my Yom Kippur experience on the day my father died. I have written about it in different ways. in parts of different attempts to tell fuller stories. Here, today. I will give only the most minimal background & then put together something from those writings. 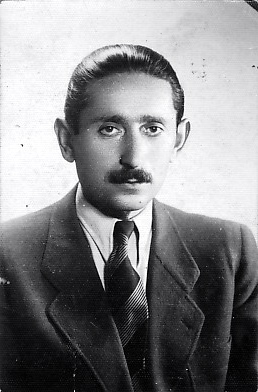 I add also this passport photo of him taken either in Warsaw or in Vilna in 1939 or early 1940 (one of the only three photographs I have in which my father appears – the others are a time-scarred family portrait of my mother & him, with their only son between them, which may be seen on my “page” Now Some of My Own Memoirings ; & a photo of what looks like a garden party photo taken probably some time before my mother became my mother, which may be seen in my post My Jewhood 001 & also on my page Ongoing) & a photocopy I still have of his death certificate. I also still have his stamp albums, but that’s not a subject for now. I have very few actual memories of scenes with my father before the rare & at-that-time incurable disease that caused him excruciating pain & took all the skin from his body, leaving him in his last months in the Shanghai Jewish hospital like a living mummy swathed all over with bandages except around his eyes, nostrils and lips. Some of those memories I’ve written in earlier pages, & I hope to publish more some other time; here I will relate only several that are relevant to this story . Through my father’s resourcefulness. which enabled him to become a successful advertising agent in Warsaw, & the foresight that guided him to travel to London in early 1936 to deposit money there & also buy diamonds & gold pieces that might be needed for bribes to help us escape, & surely no less with luck, the help of friends, & of other good people, we were able to escape not only from the Germans when they invaded Poland but also from the Soviets after they occupied Lithuania where we had found temporary refuge – though only because we were among the fortunate few thousand Jews to whom Chiune Sugihara, the extraordinary humanitarian Japanese consul there gave transit visas for a six-month stay in Japan (more about this on my page My Childhood: Warsaw to Shanghai.) & from there to find a place to survive the war years: Shanghai, the only place then one could immigrate to without a visa, because then no countries were issuing visas to Jewish refugees from the Nazi persecution & extermination programs. In Shanghai I first found religion. True, my mother had taught me as a child to say a simple prayer each night to a God I didn’t really understand, & I don’t remember how long I kept doing that. & the religion I found wasn’t Jewish. My parents weren’t at all religious, in fact as far as I know they also had very little feeling for or knowledge of Jewish culture or history, no connections with Jewish social or other organizations, although many of their friends were Jews too, mostly “assimilated” like themselves, who thought of themselves primarily as Poles, & perhaps drew drew the line at inter-marriage. In any case, I don’t remember ever hearing anything about Jewish religion at home, knew nothing about religious Judaic practices or customs, & I think I didn’t even know what a matzoh was until some time after my father died. No, the religion I found, & first fell in love with, was Christian, in fact Roman Catholic, in the beautiful private chapel in the mansion home of the parents of my friend Joboy, a story I’ve told briefly in an an earlier “page” in this blog, Shanghai (1). After they found me praying to the crucifix they were angry at me, and even more angry at the San Lazaros, who they believed had been trying to convert me. I defended my friends, and told them it had been my choice. But they forbade me to see Joboy and the San Lazaros any more, and they took my rosary away. I grieved for quite some time, and after my parents’ anger had subsided they told me I could play with my friend again but must never go into the chapel. This didn’t help me, because I just didn’t know how to face Joboy and his family and tell them I was not allowed to go to chapel with them. I told my parents this, and also said that I felt I had lost not only my friends, I had lost my contact with God. Then my father said that there were different ways of praying to God, Catholics did it one way and Jews did it another way, and since I was a Jew, if I wanted to pray to God I should do it the Jewish way. He said he didn’t usually pray himself or go to synagogue, but if I wanted he would take me to a synagogue. Yom Kippur, the holiest Jewish day of the year was coming up soon, and that might be a good occasion. This brightened my mood. Now I had a prospect of contacting God again, and also of going to a new place with my father. The synagogue as I remember it was awesome, with a huge dome that was the first thing that took my attention as we came in the wide double door from the carpeted foyer, then an upstairs gallery around three walls of the large square structure, where only women sat, and the downstairs hall with its ranges of pews centering down to a large raised platform railed with polished wood where a group of men stood swaying backward and forward in large white prayer-shawls with black stripes at the edges and long white fringes of cloth hanging from them. Beyond it, in the center of the wall where there were no pews, was what looked like a large wardrobe covered with a rich blue velvet curtain with crowns and strange letters embossed or embroidered on it in gold. There were no statues, no candles, no incense, no holy water, but there was a strength and solemnity in the mournful hum of prayer and the sight of so many men with prayer-shawls around their shoulders, all standing with books in their hands, some swaying rhythmically. I stood beside my father, who wore no prayer-shawl, but looked handsome in his dark suit and tie. He had shaken hands with the man standing next to him, who may have been a business associate, and took the two prayer-books the man had evidently kept for him. The man had opened them at a certain page, and told him to give one to me. I think my father told him there was no point in that since I wouldn’t be able to read, but the man insisted, so my father gave me the book, open, and told me to look at the pages. He himself started reading the prayers, for he his parents had been religious & he had been too in his youth until he gave it up. I looked at the pages and saw the same strange letters, large and thick squarish characters in a block of text and then more of the same shape but much smaller, then two columns of the same kinds of letters. Finding nothing recognizable or interesting, I started looking around the large domed hall, seeing here and there boys among the men, but no-one I knew. The praying continued, though sometimes everyone would suddenly sit down and go on with the praying, and sometimes everyone was quiet except for a man near the curtain who would sing a prayer in a tearful and lamenting tone, and then everyone would start rapidly reading, and then everyone stood up again and prayed even louder, then sat down again, and we did likewise each time, I didn’t know who was giving the signals for sitting down and getting up, but everyone seemed to know. Listening to the sometimes more and sometimes less melodic praying, and though I understood nothing of it I felt that there was something happening here that did have something in common with what I had felt in the chapel in Joboy’s house, where I also didn’t understand the Latin they prayed in. So when my father asked as we were going home if I would like to learn to read the prayers so I could come again and understand it all better, I said yes. And so I was enrolled in a Talmud-Torah, to learn the Hebrew of the prayers twice a week in the afternoons after school. I went with my father to the synagogue a few times more, and on the following Passover (I remember playing games with walnuts there with other kids my age), and perhaps, I’m no longer sure, on the Rosh Hashanah and Yom Kippur after that. One evening I came home and saw my father changing the dressing on the red sore in the middle of his forehead. I was startled to see how it had grown, for it had been the size of a nail-head the day he came back and told us he had been nicked there by a Japanese bayonet in an incident I couldn’t understand, and now it was the size of a large coin. It was as if the skin had been peeled off, leaving only raw flesh. When I asked him he told me he didn’t know what it was, the doctors didn’t know either, and we could only hope it would pass. He said it was very painful, but the cream on the dressing soothed it for a while, and he was also taking pills against pain. It didn’t pass. Instead, it spread. Soon more and more of his face was in bandages, and I knew that under the bandages the skin was gone. Two months after the wounding the disease had spread so rapidly and extensively that he had to be hospitalized. My mother and I went to visit him almost every afternoon. It was a shock the first time – after walking up the stairs and along the corridor, through swinging double doors and into another corridor, after which his ward was the second on the left, and he was on the third bed on the left of that, with about another twenty men in the ward – to see his whole head and upper body completely swathed in bandages, raw flesh under the bandages, you could see only his eyes and his lips, in constant pain even with constant antipain treatment which was all they could do for him, they knew no cure for this disease. I sat with them for a while, and asked him if he would soon be cured here, and he said he didn’t know, but “Everything is possible”. We were speaking Polish, but this he said in English, it was a phrase he often repeated, in all sorts of situations, and in answer to all kinds of questions I asked him. So I asked him, “So it’s possible you won’t be cured?” He shrugged and repeated, “Everything is possible”. Then I had to go to the toilet, and told them so. “Wait, I’ll take you,” my father said. He got up, slowly, put a dressing-gown over his hospital pyjamas which covered the bandages over his chest, and took me and showed me the toilet, opening the door to the cubicle, and telling me to only use the paper that was on the roll, not the paper in the basket which other people had used already, and then to wash my hands well afterwards. He said that the hospital was full of sick and infected people, and I had to be very careful what I touched, especially in the toilet, but also when I climbed the stairs I shouldn’t put my hands on the banisters, and I should push doors open with my clothed elbow, not with my bare hand. Then he left me and went back to his bed. The Shanghai Jewish Hospital, 1945. My 9th birthday, June 2. Visiting Father with Mother. Visit him often, afternoons, but today is special. 9 years old. Walking up wide path through garden space of hospital towards entrance, holding Mother’s hand. She says something to me, I don’t hear, I’m looking at play of sunlight on bushes. My birthday. don’t like coming here seeing Father this way wrapped up with no hope and he says it itches inside bandages but can’t scratch and smiles, How are you, Rysio, and I kind of see his face behind bandages all red flesh except for red lips and the whites of his eyes around his black pupils redder than before they finally bandaged his face some months before, smiles at me, then turns to her, I can’t hear what they’re saying, looking at my white bandaged father, looking at my beautiful blonde mother, at the long row of beds, Father’s is third on left from door, don’t look at other patients, stand by his bed, Father what are you feeling? I knew he was going to die. He knew too, so did Mum. He survived the war. He knew when it ended in Europe. He knew when the Japanese capitulated after Hiroshima & Nagasaki, & when Shanghai was liberated by the combined Chiang-Kai-Shek & US forces. He knew that the future for us would be different. I sometimes think he even told me I would have to be strong & help my mother. I can’t really remember. I was shocked, and didn’t know what to think, but I answered “Neither of them”. Tears came to my eyes, an overload of anguish, and I rushed blindly out to the lobby. What had I done, what would happen. I waited anxiously for this “Yizkor” service to end so I could go back and pray and ask God to forgive my error, I didn’t know, couldn’t He understand that, even though He did have all these rules I didn’t know about, but anxious as I was to get back to praying I didn’t have much hope. I kept watching the people in the lobby, to see when the doors would open and most of them would go back inside again. Every now and then I asked someone, and was answered imptiently “not yet, not yet”. Finally the regular prayers resumed and I went back to my place and mumbled for a while longer until I couldn’t take it any more, and I hurried home – to find my mother sitting on the edge of her bed, crying, and I knew. She didn’t have to say anything. I said “He’s dead, isn’t he?”, and she nodded. I sat down beside her, and asked her not to cry, and said I would look after her, everything would be all right. Now I was the man of the family. I didn’t grieve his death. I didn’t cry when I saw my mother crying, and knew; and I didn’t cry at the funeral, when I stood beside my mother, my uncle Dodya and Aunt Hela and cousin Karol, and some twenty other people, friends of my parents, while a rabbi intoned the prayer over the open grave. I was given a card with the Mourner’s Kaddish printed on it in Hebrew and in English transliteration, and was told to read it out, and I read it laboriously, yis-gadal ve-yis-kadash sh’may rabbo, and more, about fifteen lines of print, and then his coffin was lowered into the pit, and everyone threw handfuls of earth onto it and then shovels filled the pit, I watched the earth rising and the coffin disappearing. My mother cried, my uncle cried, other people cried, and I stood there wondering why I didn’t feel to cry. And two days later, walking along a street by myself, I suddenly noticed that I was gaily whistling to myself, and remembered I should be in mourning & remember feeling bemused that this was so. For three years after this, until my bar-mitzvah, I went to a synagogue often & especially on his yohrzeit, Yom Kippur, to recite again the “Mourner’s Kaddish“. Then I too, as he had done before me, for reasons that I may write of another time, stopped following religious observances. Some years I have lit a candle in his memory on Yom Kippur eve, but it’s many decades since I’ve done that. He lives in me as he lives in me, I hold his memory precious though I have so few actual memories of him. My mother & I hardly ever spoke to one another about him, perhaps not to arouse one another’s grief, & I have often thought that for me (& perhaps even for her that was a great loss, but what was was, & I do have what she has written about him in her memoirs, & much much more of him in my soul. This in brief is the story I wanted to tell today. 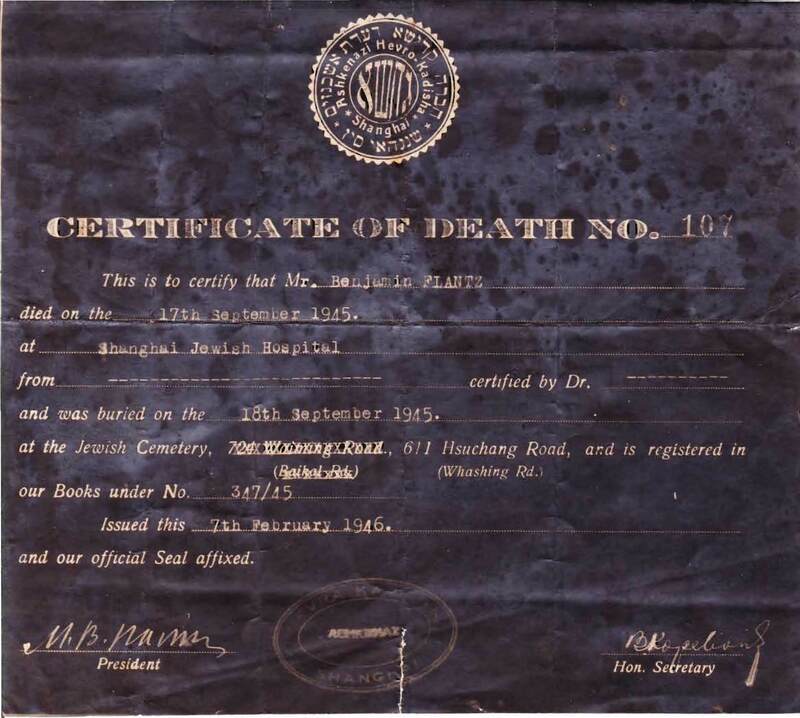 & here’s a scanning of the photocopy of his death certificate issued by the Ashkenazi Hevra Kadisha in Shanghai. Very touched by your story. You Are very honest and sincere and i hope this will givevan Aliyah to your father soul since it is his yortzeit every kippur. It is not for any reasons that the first day to go to Shul was in kipur, since it is a very significant day for all of us. the part for the Yizkor when you were asked if one of Parents is dead was for you like a kind of. a preparation for you. Since a child of 9′ years old in shul, you were brave. Yachir Coach!